I run a script as a pre-req using the registry to store information I want in the task sequence. When the Task Sequence runs it can then read the registry. Willl have to play with this. hey mate, nice article , could come in very handy for a problem i’m working on. Just a tip – if you use -session:1 , thats always the console session. RDP will be another session, could be 2, or 3 etc. You would need to use some logic to determine the session and set that as a variable for the TS command line. powershell can manipulate sessions and find the session id for a specific user etc. Awesome, I appreciate the tip!! I go to the Interaction tab on your Advertisement and check the box “Show the task sequence progress”. Then run a command line in the task sequence ServiceUI.exe -process:tsprogressui.exe %SYSTEMROOT%\system32\mshta.exe my.hta. Found it on another site and as long as you dont mind moving the progress bar out of the way it is a quick and dirty way to ensure the HTA displays in your current session. Thanks – I appreciate the additional info! I am working on the same issue, I am able to get the HTA to display to the user within Windows as a prerequisite action in the task. But, I am unable to pass the variables with “Microsoft.SMS.TSEnvironment” object because it can not create the object. How are you passing the variables to the task sequence? The VBScript object Microsoft.SMS.TSEnvironment (inside your HTA) should be the one writing those to the Task Sequence. Yes, I am using the object within the script section of my HTA set env = CreateObject(“Microsoft.SMS.TSEnvironment”) but, I get a scripting error, ActiveX component can not be created. As if it is not running in the task sequence. Now this is in Windows before rebooting in to PE but, it is still an action of the task sequence. The issue that I was having was executing the HTA on a x64 system. The COMObject Microsoft.SMS.TSEnvironment does not work in a 32-bit process on a 64-bit system. Once I changed my task to launch using the following command the COMObject started working. Good find, thanks for sharing the solution. you stopped a MAJOR headache that im having during the past year! thank you very much for your post, I have succeeded of making it work! Glad this helped! Keep in mind this post was written for ConfigMgr 2007. There is a newer built-in process for ConfigMgr 2012.
nothing ive tried worked for CM12..
do you have that link for the newer built-in process? 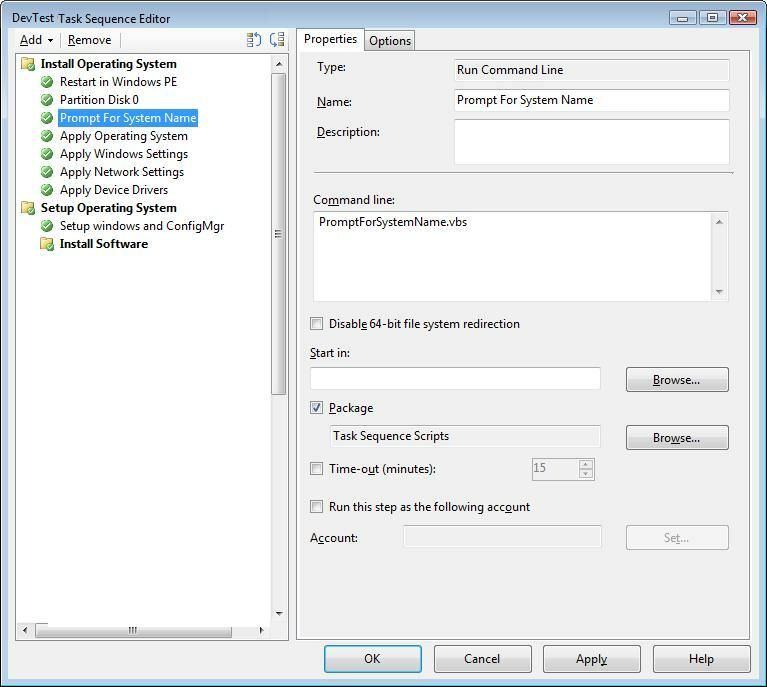 This helped me realize I needed to integrate MDT into SCCM but I ended up following this guide to successfully get HTA working with SCCM 2012. Be sure to read the comment section at the bottom mentioning the two need prerequisites.